People in Philadelphia walk past a placard posted on a newsstand with a message of support for imprisoned rapper Meek Mill. Mill's imprisonment on a probation violation set off a flurry of legal appeals, criticism of the criminal justice system and rallies in the city last fall. When the Eagles clinched their first-ever Super Bowl victory on Sunday — that will always feel wild to say — my friends and I joined the joyful, inebriated throngs in a spontaneous pilgrimage to Philadelphia's City Hall. And at Thursday's championship parade, you'd likely hear many of the same full-throated chants that we heard right after the win. The Eagles fight song, obviously. Some colorful suggestions for what the vanquished Tom Brady could do to himself, also obviously. 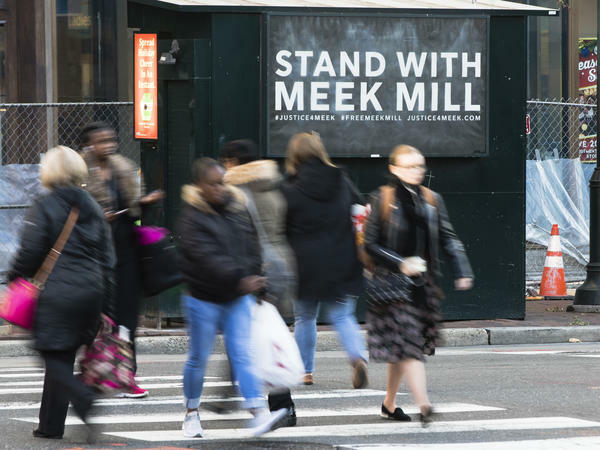 And then another, more charged exhortation: Free Meek Mill! Meek Mill, whose real name is Robert Williams, is one of the highest profile rappers ever to come from Philly. And when the Eagles ran out onto the field on Super Bowl Sunday, they did so over Meek's "Dreams and Nightmares," a song that they had been playing at the team's practices since the playoffs began. The Eagles picked "Dreams and Nightmares" as their hype song for functional reasons — it's a song about overcoming long odds and constructed to make you feel like you can run through a brick wall — but there was something political about the choice as well. Meek had been on probation for nearly a decade stemming from a gun conviction in 2008, when he was 21. Then last year, he was sentenced to two to four years in prison for violating those probation terms. He had a long and spotty probation history, with a grip of failed drug tests and missed court appearances, some of which extended his probation. There are many, many people of far less means than Meek Mill in similar binds — ostensibly free, but constrained by their probation terms. (Imagine trying to find a job or public housing with a felony conviction and restrictions on where you can travel.) There are currently more Americans on probation than on parole, in prison or in jail combined — and the racial disparities in probation are as stark as they are in every other part of our criminal justice system. A 2014 study by the Urban Institute found that across four different counties in the U.S., black probationers were 55 percent more likely to have their probation revoked than white people were. It's fitting, then, that the Eagles managed to smuggle a little of this messy context, however briefly and however elliptically, into the Super Bowl. The NFL tried its best to hermetically seal the game off from the tensions roiling the wider world. Any notion that the NFL existed outside the sphere of politics was always a tortured fiction, and it was demolished for good this season, when the biggest storyline was the on-field protests around race and the criminal justice system. In a move that seemed especially aimed at reassuring fans who might have been turned off by that kneeling, and felt it unpatriotic, there was an especially showy celebration of several World War II veterans during the coin toss. There was no visible protest on display that day, not even from Malcolm Jenkins, the Eagles outspoken safety. But there was Meek, at least, if only in sound and spirit.